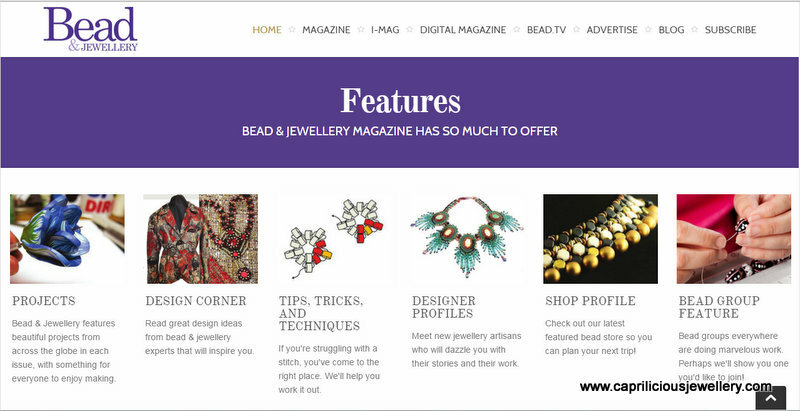 In January 2016, Bead and Jewellery Magazine refurbished their website and I was pleased to see that they had used the project sent in by Caprilicious (published in Issue 68) on their webpages. 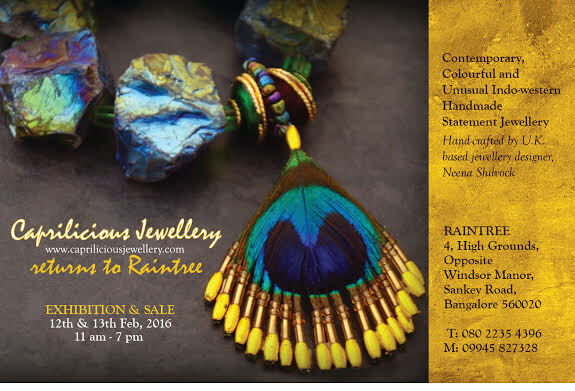 Ila Kapoor from Chandigarh writes this fabulous blog, with absolutely exquisite imagery - Peacocks In The Rain - I stumbled on it and given my obsession for the bird, we hit a rapport immediately. 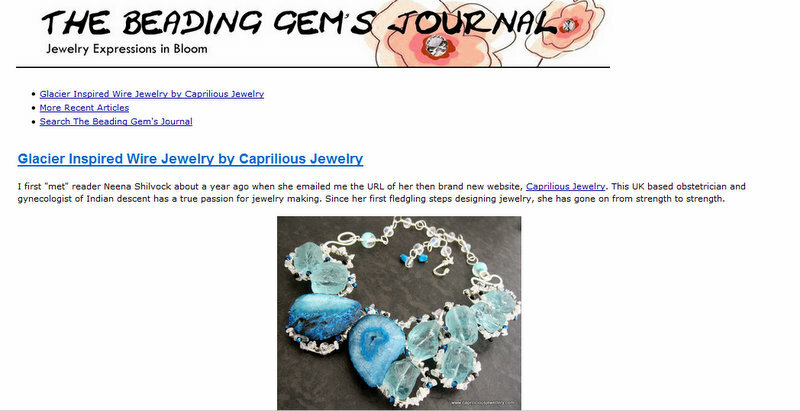 She made my day - I had an email telling me that Caprilicious Jewellery had featured on her blog this morning - thank you very much Ila, I am honoured!! 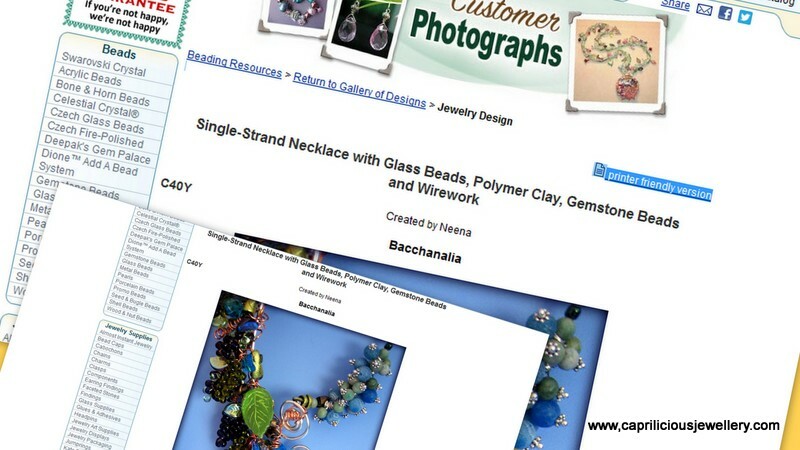 Bacchanalia was accepted onto Fire Mountain Gems' Customer Photograph juried gallery - an honour indeed! 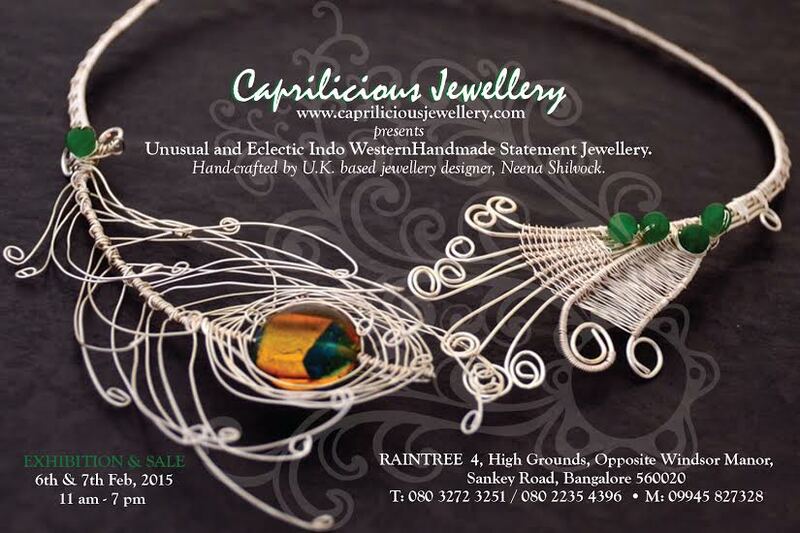 Caprilicious Jewellery - a great site I met Neena a couple of days ago when she contacted me about my zentangles. 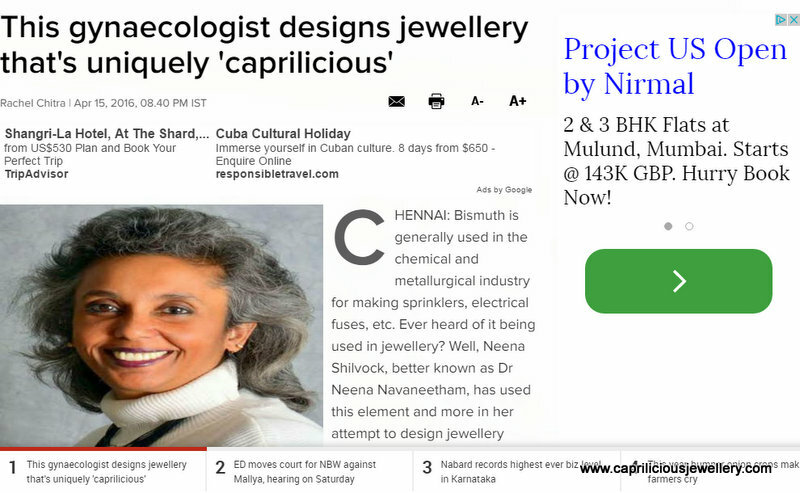 This lady makes some of the most beautiful and unique jewellery I've seen. 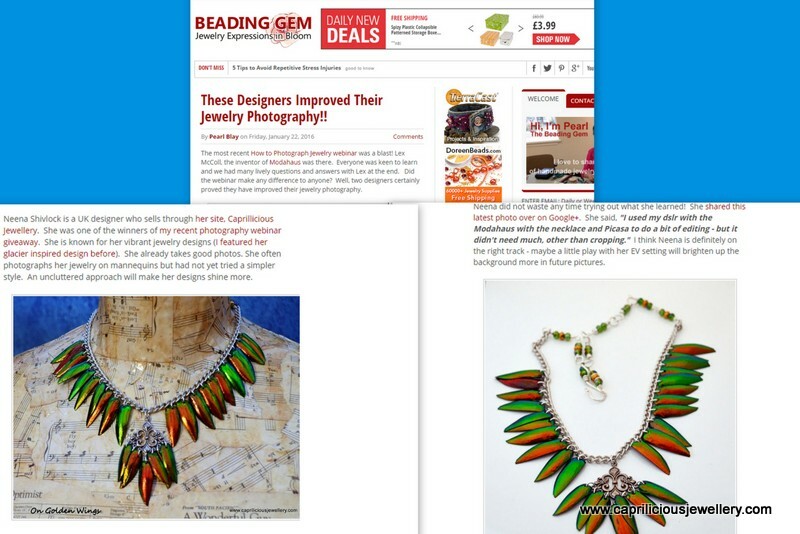 She had made a "zentangle inspired necklace" and wanted to use a couple of my pictures. 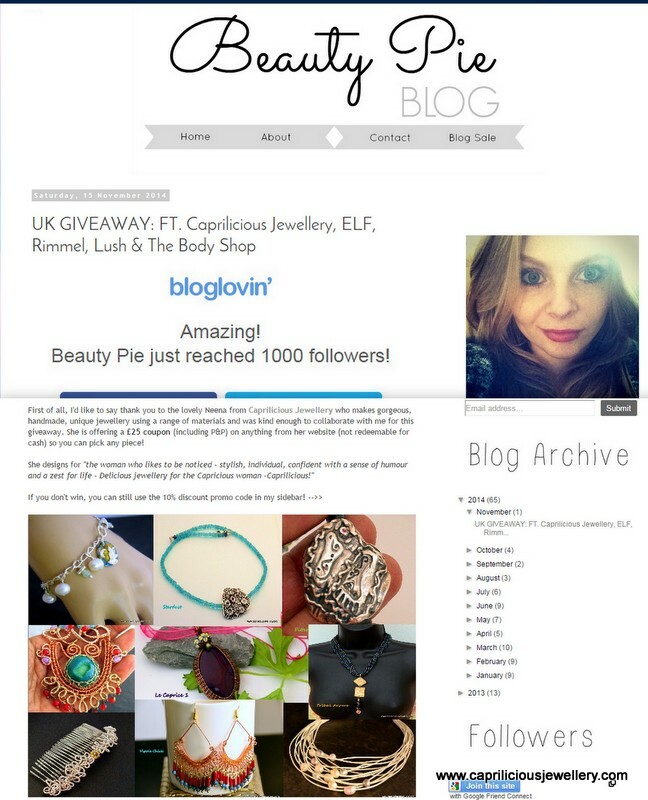 I agreed and went to have a look at her site and her blog and Oh my! I was so inspired. 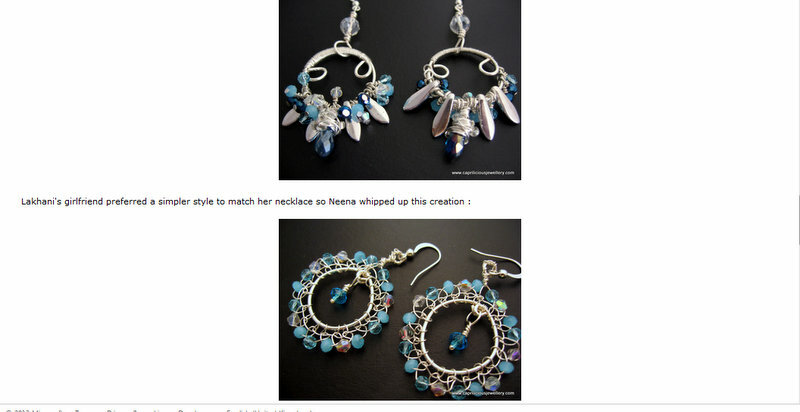 Her handmade creations are truly something special and her blog is lovely to read. 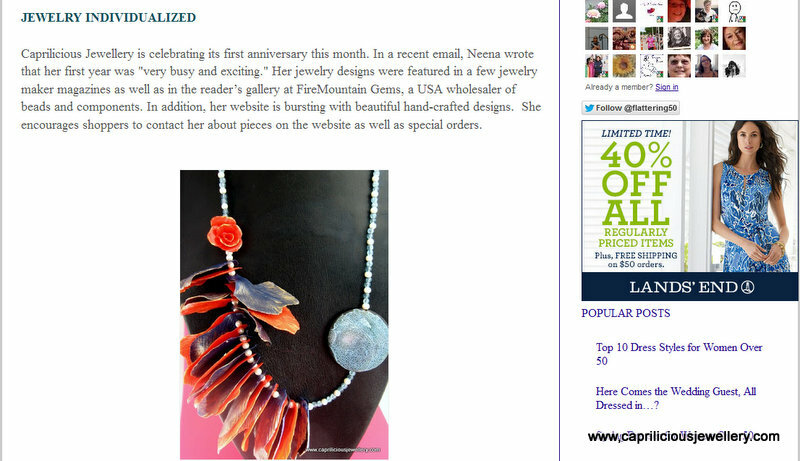 After spending some time on her site and blog I felt the need to spread the word. 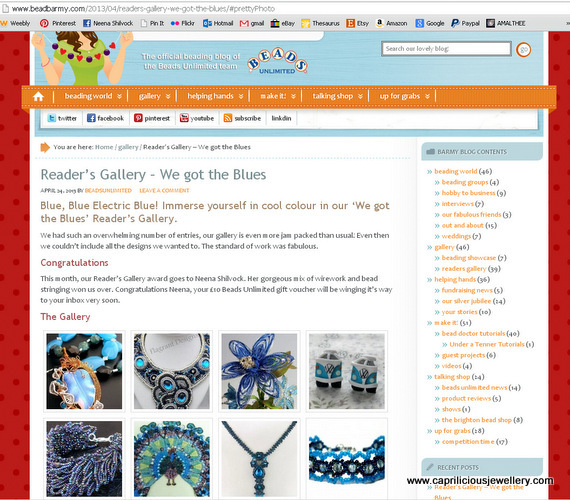 I only ever write about and recommend sites that I find truly inspiring and this one definitely fits that category. 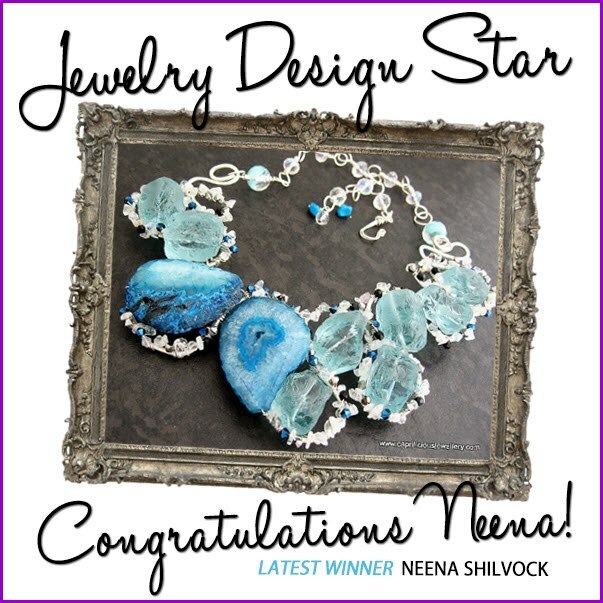 If you like unique things you will love her jewellery. 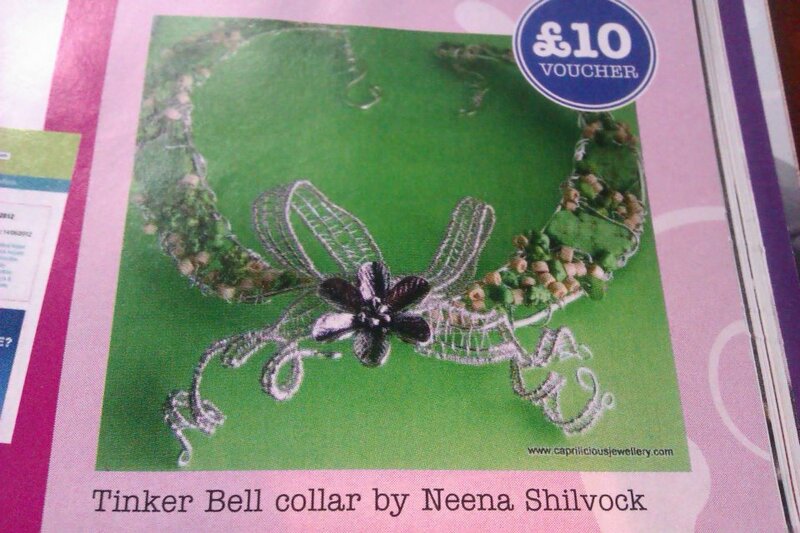 The Dew Fairies Dream Collar below are Neena's own words taken from her site. 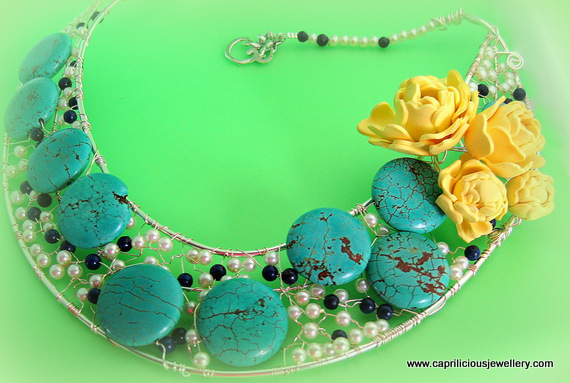 I design for the woman who likes to be noticed - stylish, individual,confident, with a sense of humour and a zest for life - Delicious jewellery for the capricious woman - Caprilicious! ﻿Flattering50 My mission: To find fashion for women over 50 that exudes sophistication, energy, and a continued sense of wonder. 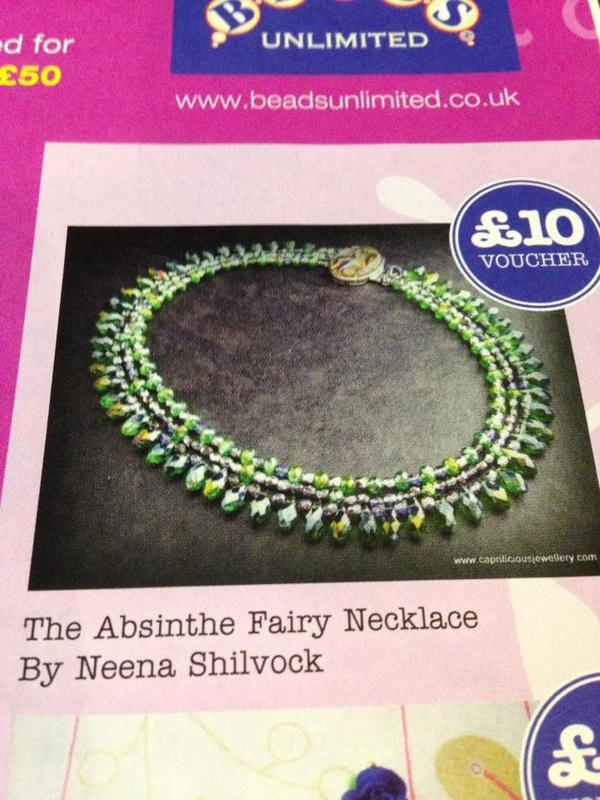 I submitted this design to the Beads and Beyond online readers gallery and won a £10 voucher in the August 2012 issue. 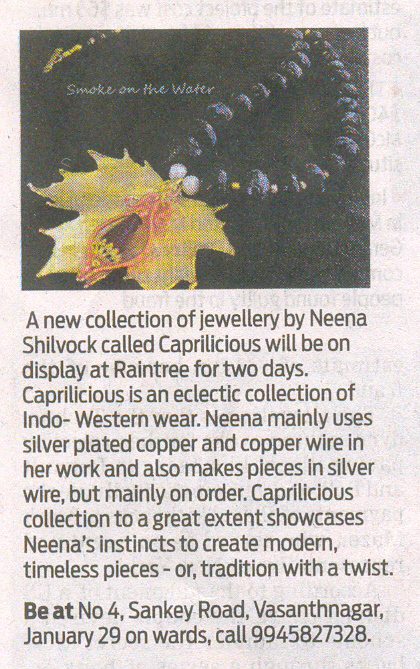 My thanks to all those who voted for Caprilicious. You can read what she had to say here. 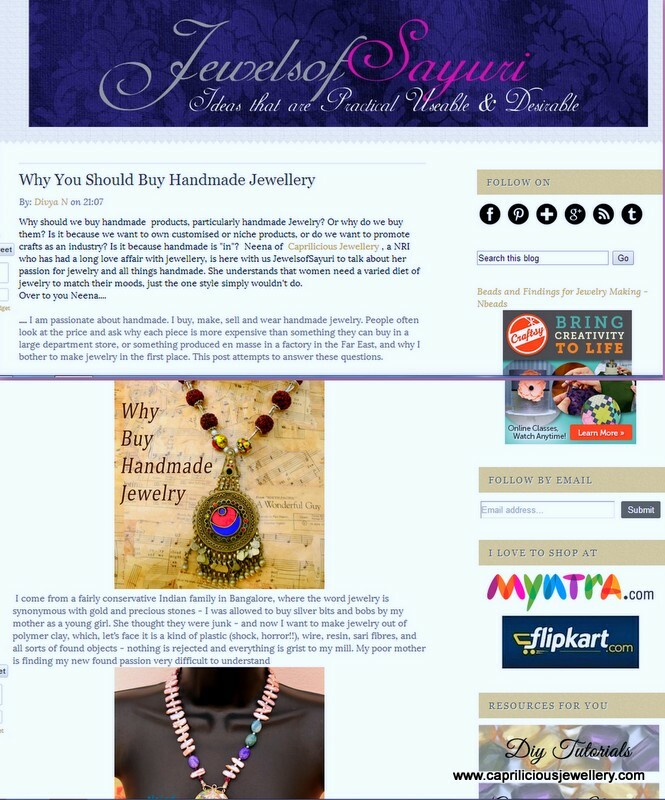 Masala Mango Mantra is a blog uniting artists, designs, decor, fashion, food from around the globe and that which is Indian inspired by design - Reshma Sandell, a talented jewellery designer from Mississauga Ontario featured Caprilicious Jewellery on her blog. 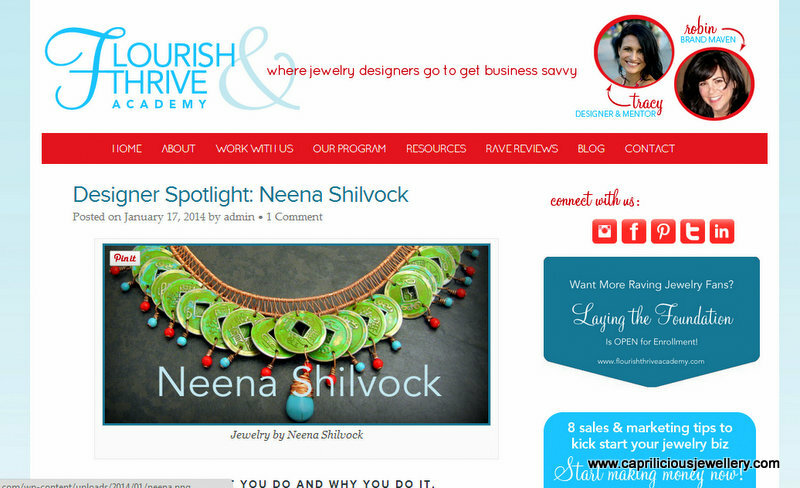 This blog is written by Sruthi Singh ' a mother, wife, artist, and a huge decor enthusiast. 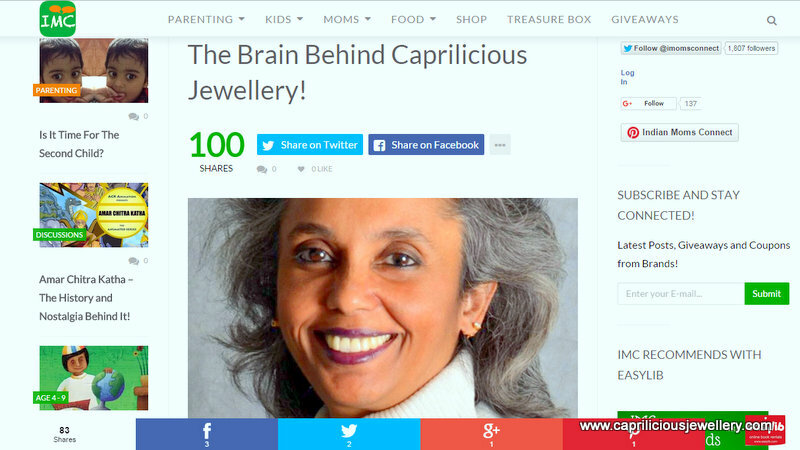 Decorating her sons room has led her to opening an online children's art boutique on Etsy called "The Yellow Bamboo". 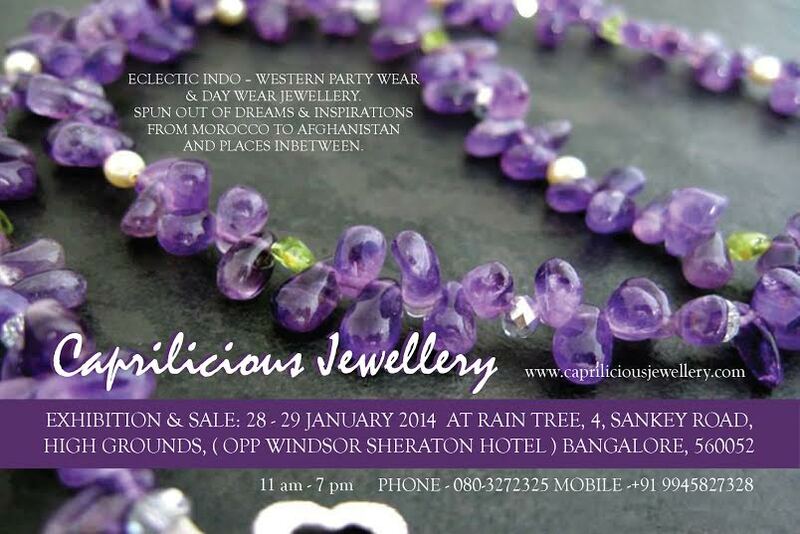 Sruthi comes from India and enjoys the fact that she has the best of both worlds. 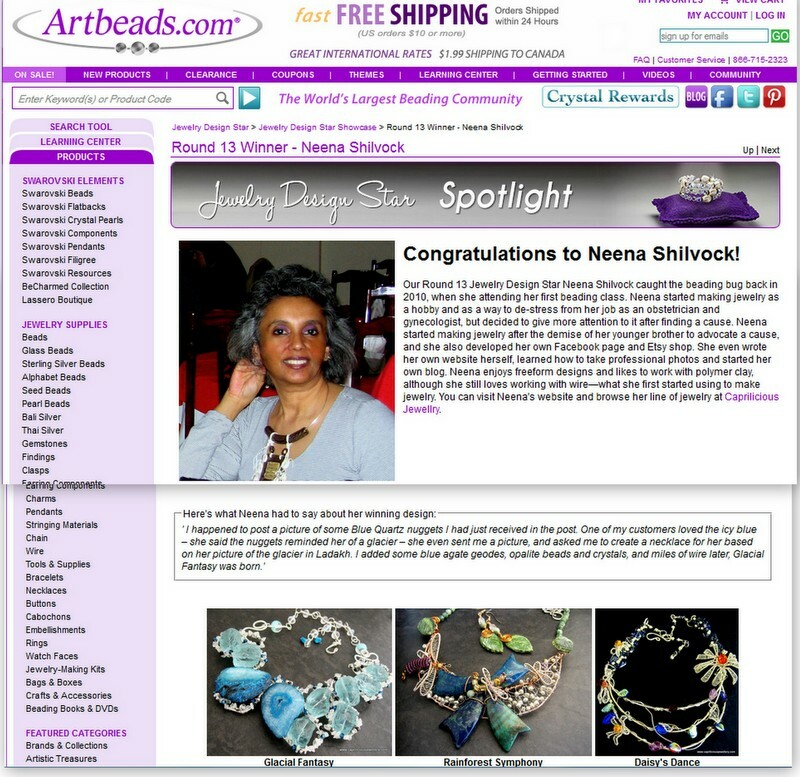 She says"The East Coast Desi" is my space to archive and share all things inspirational to me. 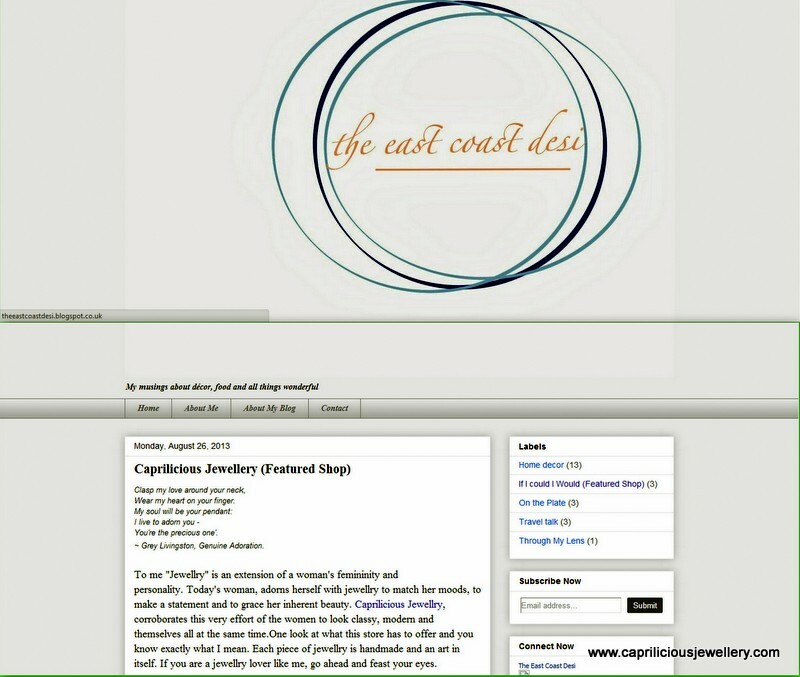 Her blog is an archive of her musings about décor, food and all things wonderful. 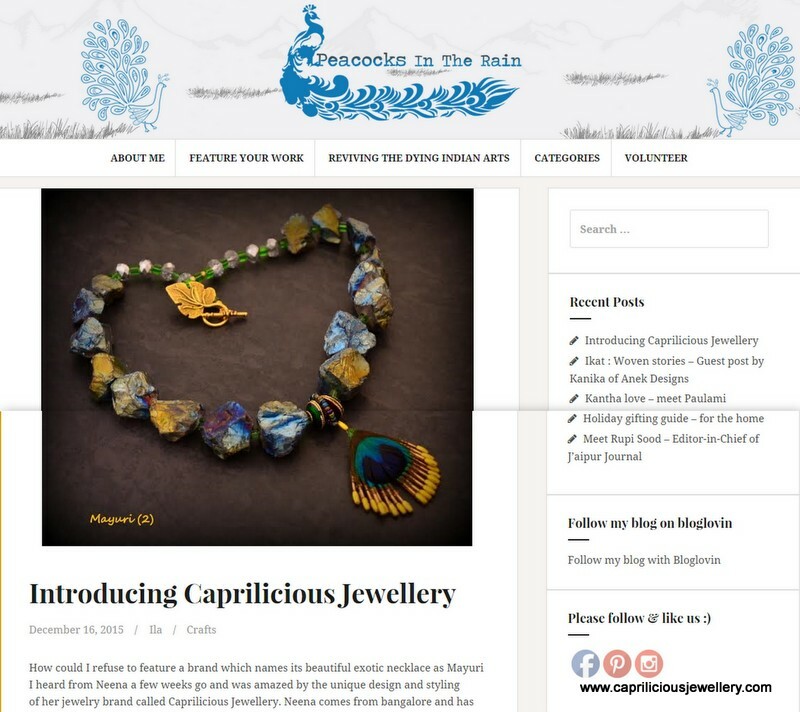 She loved Caprilicious Jewellery and wrote about it in her blog. 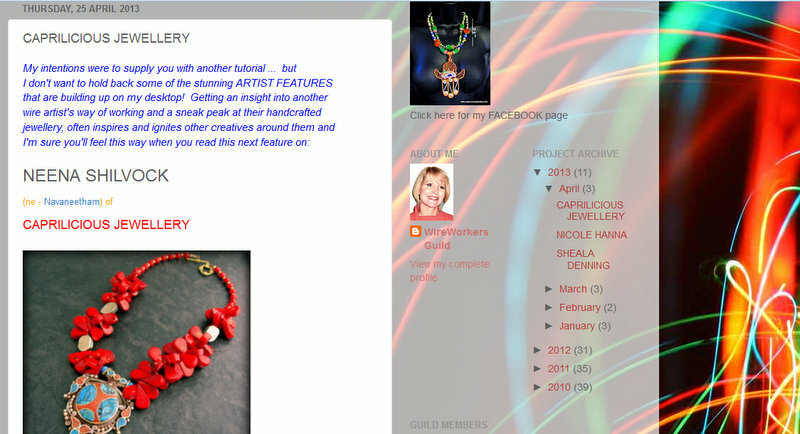 This blog is a resource for anyone who adores beads, jewelry or handmade crafts. 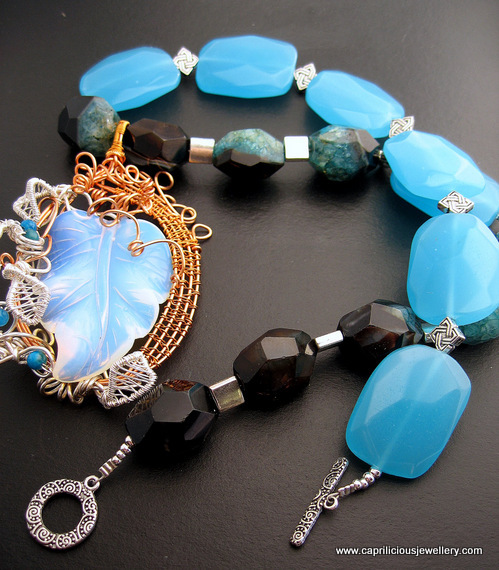 With each post, Mortira hopes to inspire new ideas for using beads, colors, and techniques. 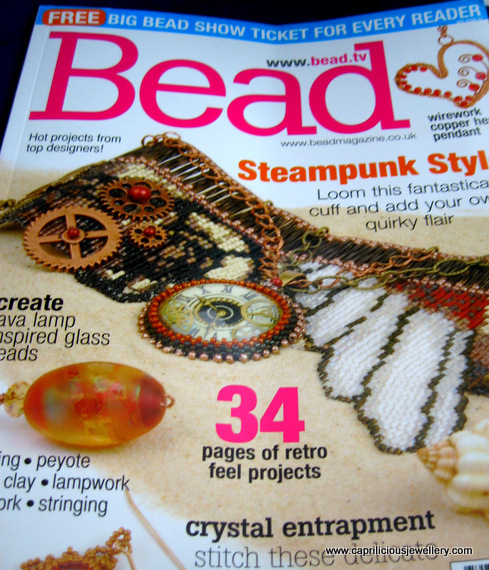 Mortira says 'Beading is my number one passion, and I am always looking for new and interesting things to share with my fellow crafters. 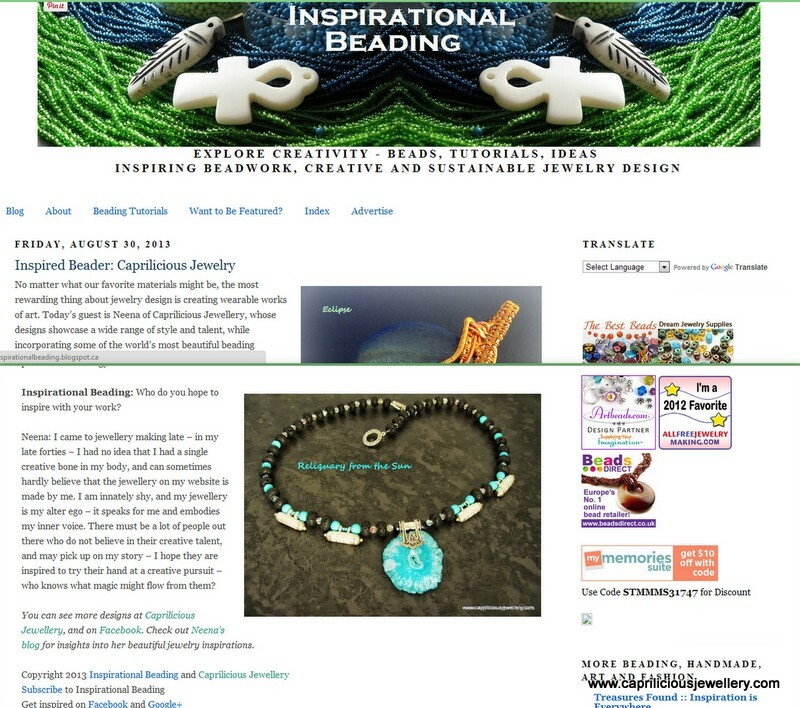 Inspirational Beading is a blog for everyone, and anyone that loves beads, jewelry, color, crafts, or fashion. 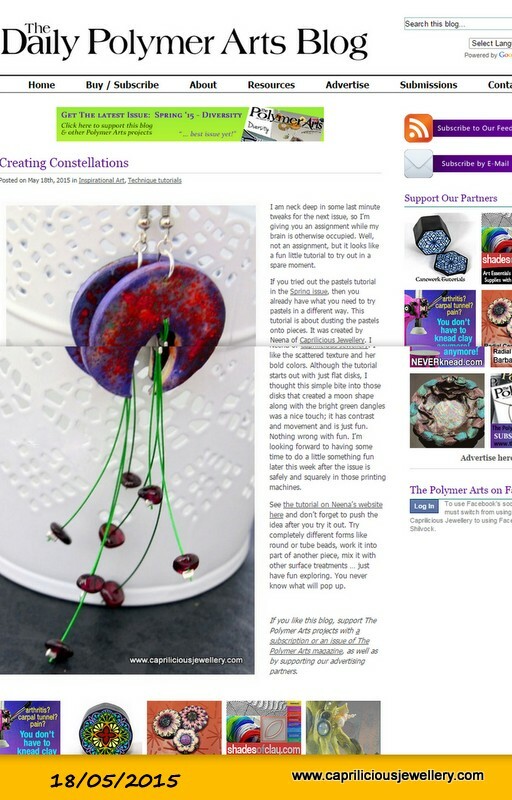 Whether you string, weave, embroider, solder, or smoosh, I hope that this blog will help inspire you'. 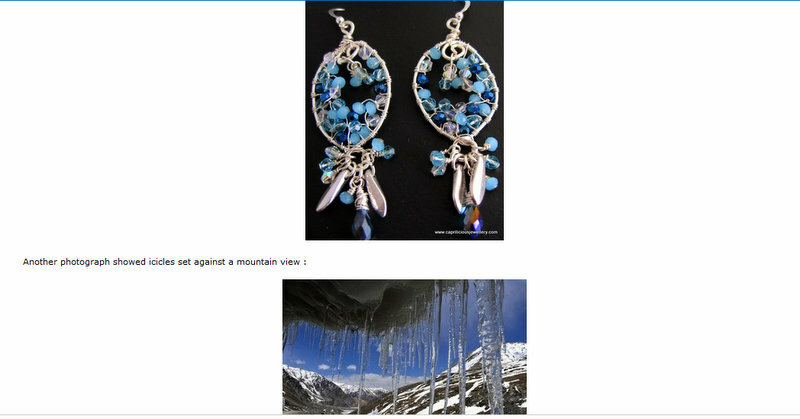 Mortira lives in a beautiful city - Nanaimo, on Vancouver Island and love to support her fellow artists, and the small businesses that supply us with our materials, even when our ideas are different. 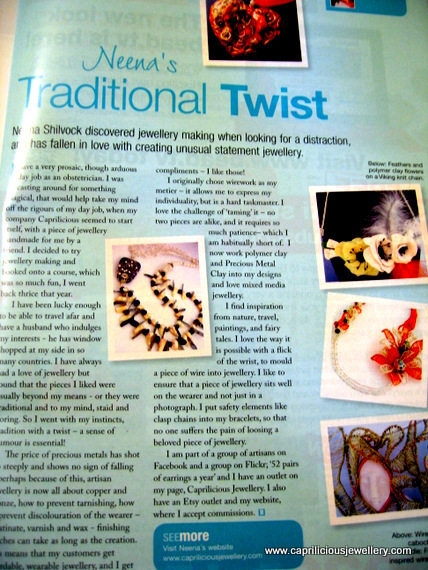 Robin and Tracy run the Flourish and Thrive academy, teaching jewellery makers to set up a successful business. 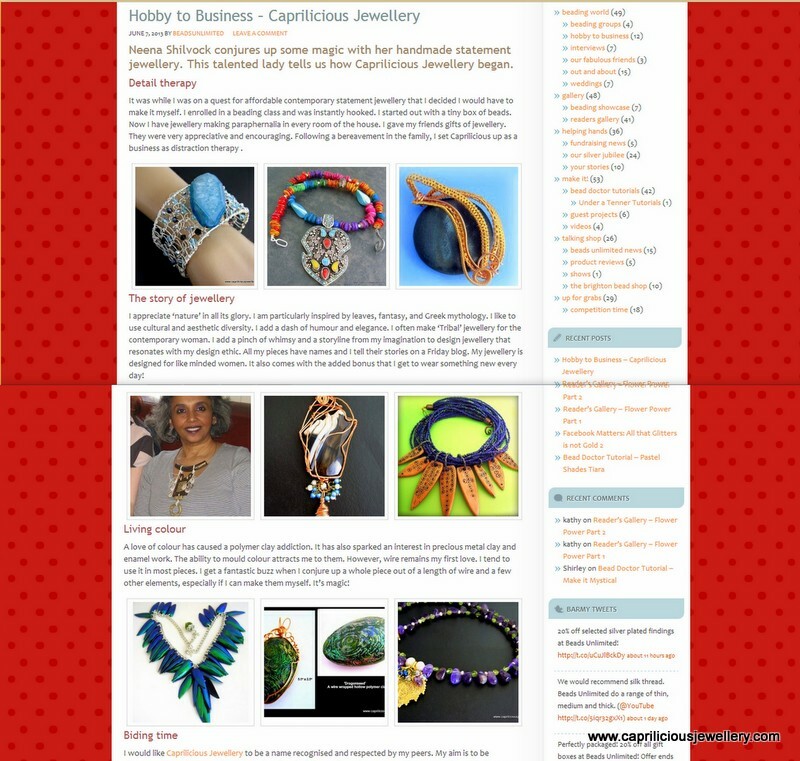 They featured Caprilicious Jewellery on their blog in Jan 2014 - you can see the whole feature here. 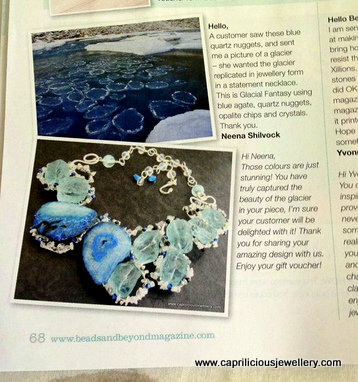 I 'met' Catherine Rowan on Facebook through a forum for jewellery makers and when she set up a new blog and asked if she could do a short feature on Caprilicious, I was honoured and agreed readily. 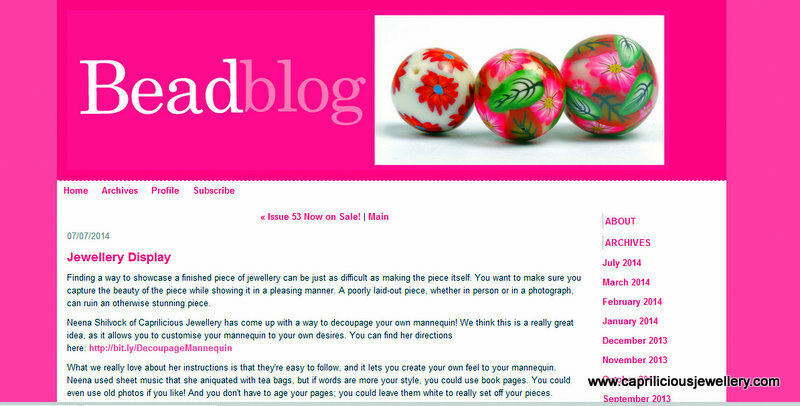 Allison Roe, editor of Bead Magazine put my lens on how to decoupage a styrofoam mannequin on her blog, Beadblog in a post to do with Jewellery Display. 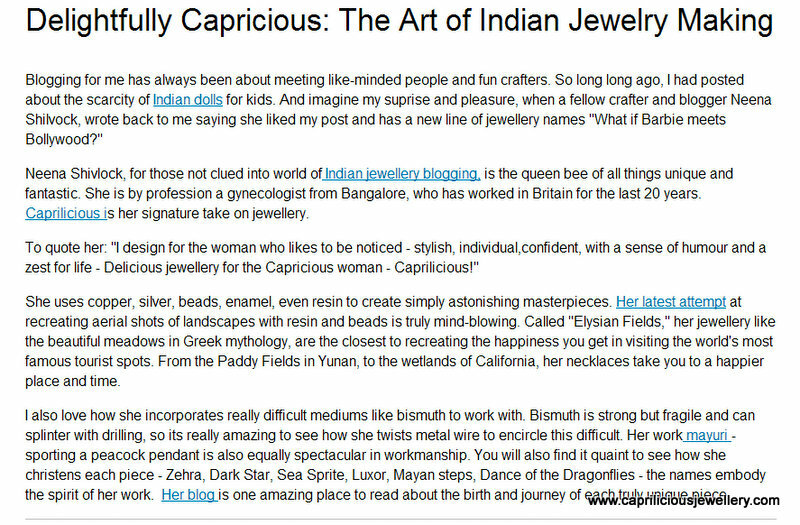 Rachel Chitra gave Caprilicious Jewellery a mention in one of her blog posts. 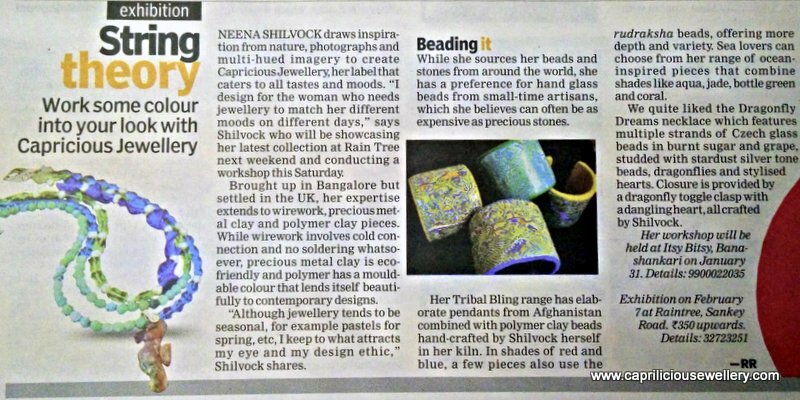 This was a write up in The Indian Express prior to my second exhibition at Raintree in Feb 2015. 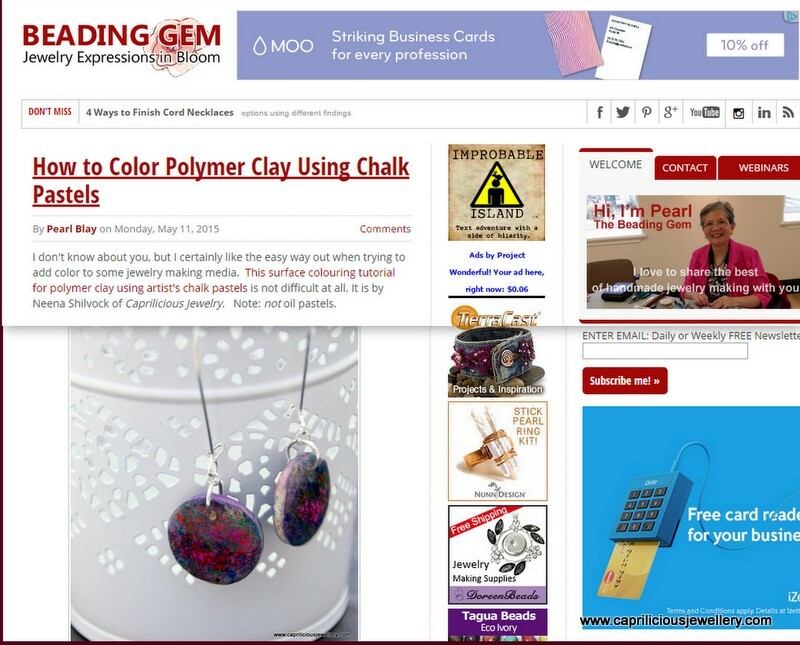 The little tutorial featured in The Beading Gem's Journal above was unexpectedly posted on The Daily Polymer Arts Blog a week later! 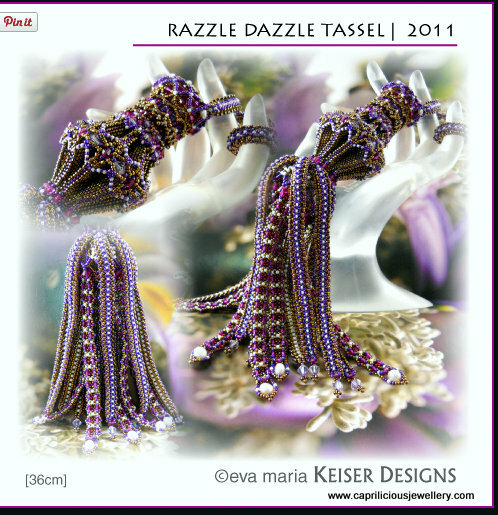 Eva Maria of Keiser Designs makes the most beautiful beaded jewellery. 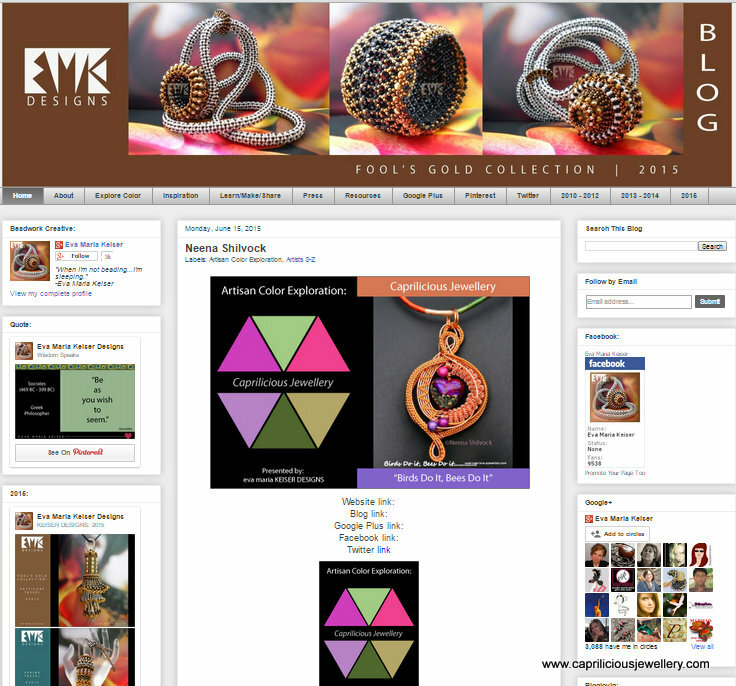 On her blog she breaks down the designs of various artists into their component colours. 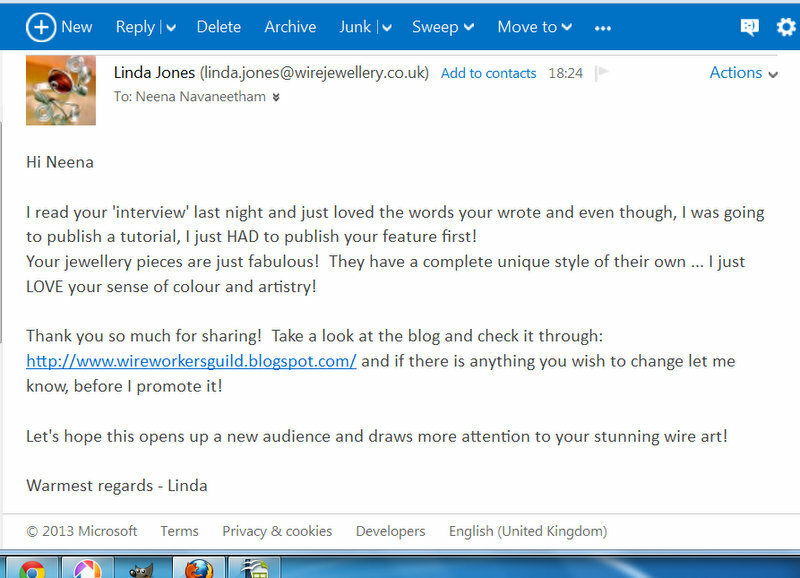 I was thrilled when she approached me to ask if she could feature 'Birds do it, Bees do it......' on her blog.